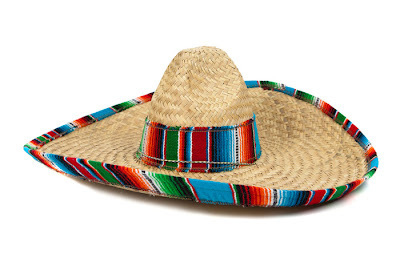 I'm off to buy a sombrero! Lots of things are happening that are all pointing towards me having to gather all my hats and trading them for a huge sombrero. I have always been proud of my many hats ... and have managed to keep them very separate from each other. My consulting hat, my mentoring/coaching hat, my author hat, my blogger hat, my cheerleading hat and my business hat. They were all neatly lined up on the hat rack, each one being worn on its own depending on the day and the priorities. Last week my marketing guru - Amalia from arpace - said that she needed to "brand" me. Brand me? How terribly cowboy. I'm not sure if a tattoo on my arse is the way to go, I'd prefer to stick with hats. But if I were to be branded, what would my brand look like? Last week I was chairing and speaking at a conference. I handed out my business card ... the consultant one. I also handed out my author one. I also left details about Sirens Cheerleaders. Three different hats in one outing. Then I went to the blogger conference. I had no business card for Deep Fried Fruit. So which one should I hand out? I decided on the author one but that gives no details for DFF. How incredibly confusing. I have always tried to keep this blog separate because it's my outlet, my middle aged ramblings, my mummy space, my Leanne zone, but is it perhaps time it becomes something more? The sessions at the conference suggested "yes". There was a lot of talk about branding. I starting thinking my Miss Amalia was right. Then I won the Disney trip and I realised that was not only a great bloggy opportunity but it was also a chance to promote myself as a consultant, coach and mentor. It was also a chance to promote myself as an author and the launch of my new product line. I realised in that moment that I had to ditch all my hats and buy one big arse hat. It was time to go sombrero shopping. The second phone call I made after that Disney win (the first of course being to my family) was to Amalia. I get it now, I said. I agree with you. It's time I was branded. Perhaps I need to ditch all my titles - consultant, mentor, coach, cheerleader, author, business owner, blogger - and just become Leanne. One great big sombrero wearing Leanne. Amalia got excited. She has a vision for me that possibly surpasses my own. Apples is apples Lucy. I think of you often as I take big bite ...you're right!